A gently curved ceiling and modern, wooden furniture for a warm ambience. Conveniently arranged furniture and fittings give a comfortable, relaxed experience. 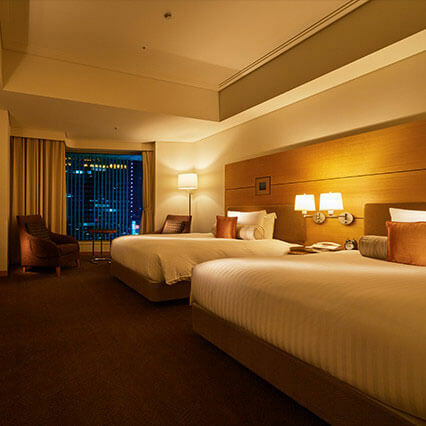 Our most basic room, suitable for those on business as well as those travelling for pleasure. The oriental-inspired roll-blinds and soft lighting help create a warm, restorative space with a Japanese feel. 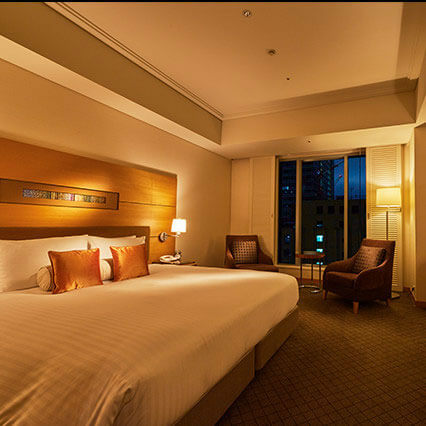 Positioned on the opposite side of the hotel to lively Tokyo Station, it's a perfect choice for those seeking ultimate tranquility. Some rooms offer a view of the rooftop garden. 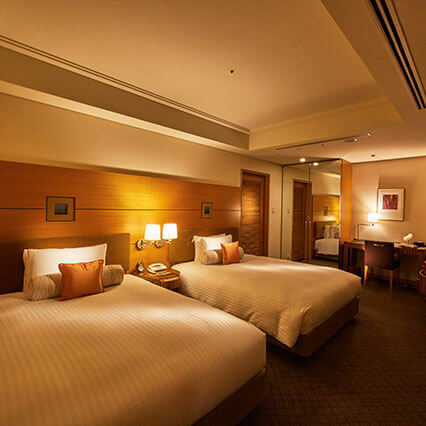 Our double room offers the ultimate relaxing stay. 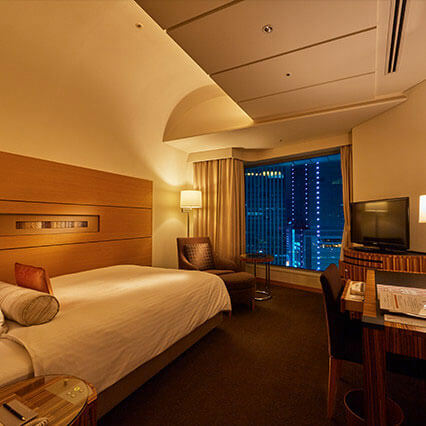 From our large windows, you can watch the ever-changing face of Marunouchi beneath you. Like our other room types, the room's top-quality king-size mattress is made by Simmons, and is guaranteed to provide you with a great night's sleep. Experience that incomparable feeling of waking up light and ready for anything. 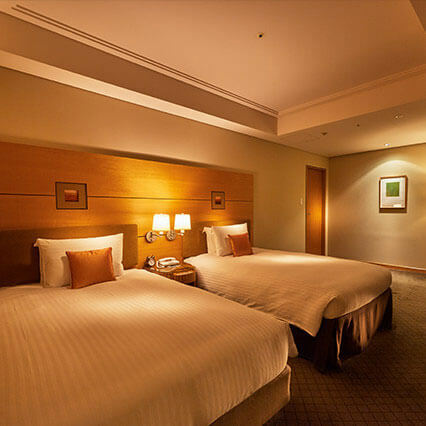 A spacious twin room for maximal comfort. Perfect for couples or parents and children to enjoy a relaxed time together. Wooden furniture gives a warm ambience to this capacious space. Sit back in an Ottoman chair and take in the spectacular view stretching out before you. 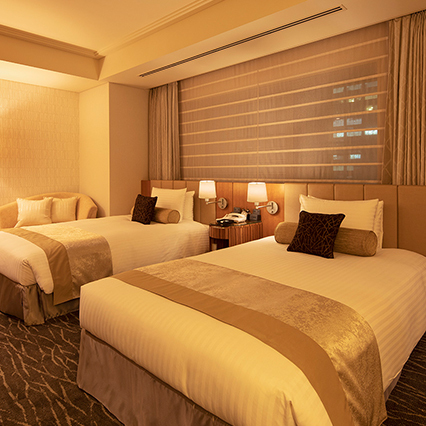 A chic double room that's ideal for relaxing your body and soul. The screen and long hall leading in from the door create a feeling of snug privacy for a stay that feels truly relaxed and comfortable. Perhaps the most unique room we have on offer, this Deluxe Twin comes complete with a tatami-floored living room. We're sure you'll enjoy relaxing in this traditional Japanese space with a sunken "kotatsu", natural feel of the tatami and wood, and the soft lighting. The room can also accommodate a third guest on a futon in the living room. The spacious bathroom separate from the toilet, complete with larger tub and traditional Japanese separate washing area, is another reason for this room's great popularity. A capacious twin room with space for an extra bed for a third person if needed. Even with two beds in it, this peaceful, relaxed space gives plenty of room to walk around. The conventional Japanese bathroom with separate washing area makes this a great family choice. Our most spacious double room. The long hall leading inside from the door gives a feeling of privacy, and the luxury dressing table makes this a favorite with women who enjoy getting ready in style. 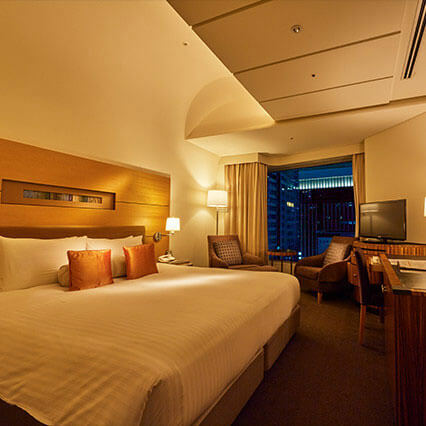 Not only is the room deliciously capacious, but it's positioned on the opposite side to the station for ultimate quiet. A popular choice for overseas business guests. 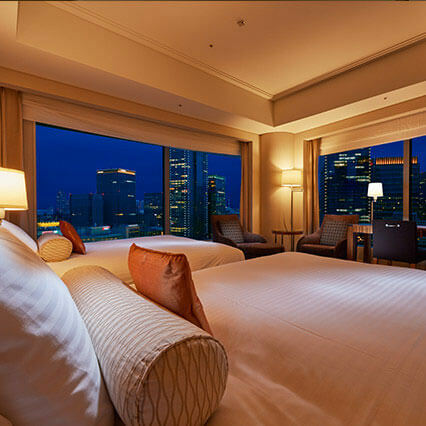 Savor the most stunning view in the entire hotel from the comfort of your room! 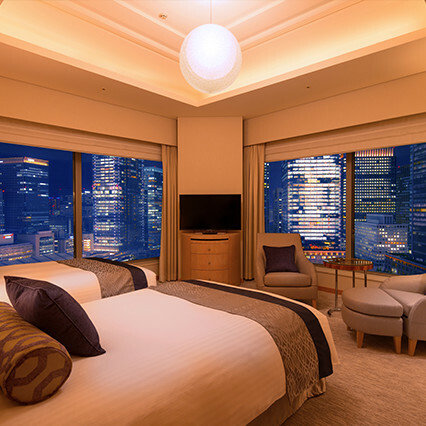 Positioned outside the two large windows stretches a panoramic view of glass-paneled buildings and the Tokyo Station surrounds. 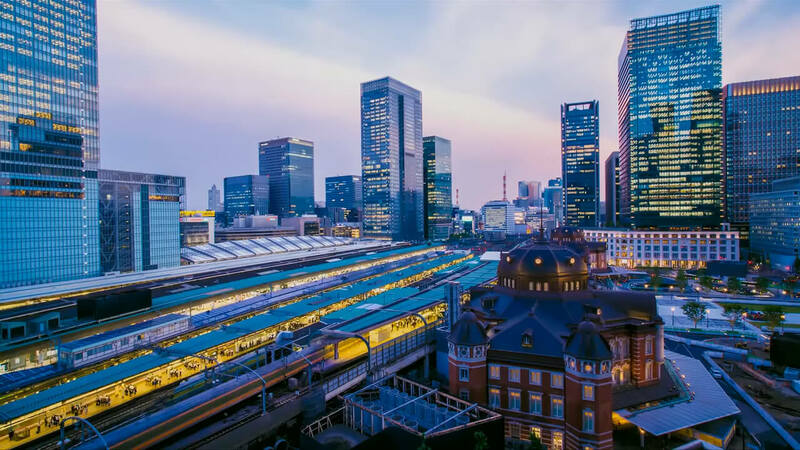 You'll love watching Tokyo as it races on busily beneath you from this superbly tranquil, relaxed space. 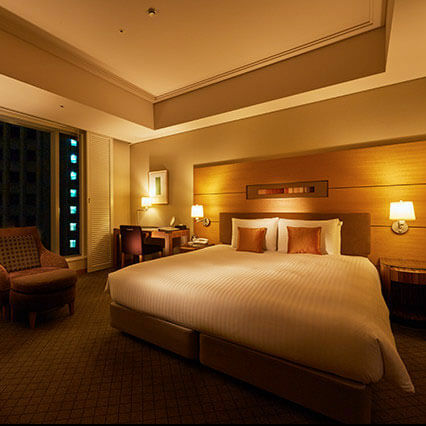 A suite room with superlative quality facilities and fittings. Avoiding excessive glamour, we instead created a refined, harmonious space with warm natural materials that truly feels like a safe haven in the heart of the city. The bedroom space, with its distinctive headboard design, flows organically into both the living room and the bathroom with its bath with Jacuzzi function and shower booth, but these can also be screened off for privacy. A room incorporating Universal Design principles so all guests can stay in comfort. The desks and tables all have rounded edges and the sofa converts into a bed to accommodate a second guest. The bathroom and the toilet have also been designed with the utmost care and attention. Here you will find time to relax and unwind. 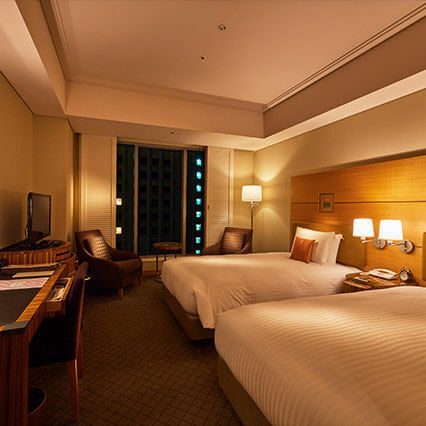 Copyright©2019 Marunouchi Hotel CO., LTD. All Rights Reserved.